Lunch was at the very eclectic and pink Rothschild Estate in Cap Ferrat, a very narrow promontory jutting out into the Mediterranean. I'm not really a salad person, but it's easy to see why salads are so popular overseas. Olives, pine nuts, ham, cherry tomatoes and goat's cheese worked very well together with the crisp lettuce to produce a one-dish meal that was satisfyingly filling and probably (hopefully) quite nutritious. We had dinner at Le Chateau Saint Paul, a restaurant with an exquisite view, by virtue of the fact that Saint Paul is a town located in the mountains above Nice, and the Chateau is located high above Saint Paul. 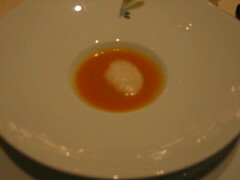 We were served an amuse-bouche of pumpkin creme with (I think) hazelnut foam, which was very nice. The problem I always face with pumpkin soup back here is that it never seems to retain its pumpkin taste very well, but no such problem with the creme. Even though it was creamy and topped with a different tasting foam, it was a pleasure to drink all the same. Next came the starter of tomato gazpacho and aubergine puree with tomato coulis and arugula. I didn't really like the gazpacho, there seemed to be something very sour in it, rather like lemon juice. The aubergine puree was excellent though, even for someone who's never touched an aubergine before. It was really quite sweet and mellow. 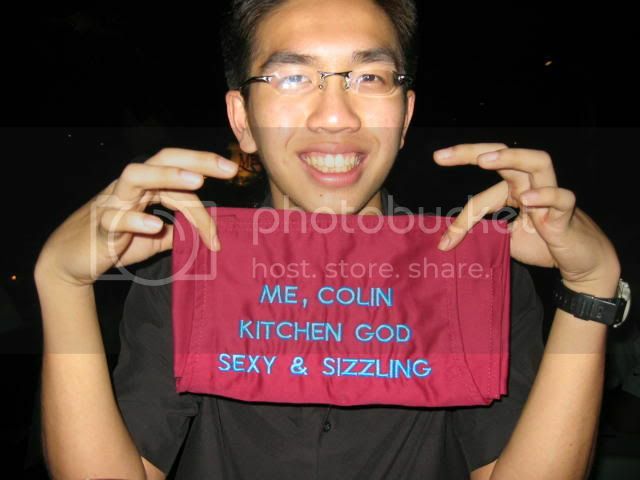 Because I had ordered from the set menu, I was served two main courses. 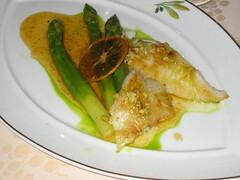 The first was a grilled dorade with asparagus in and orange zest sauce. I'm not really a fan of seafood, and in my opinion the fish wasn't improved by the citrus sauce. Somehow the acidity just didn't go well with the dorade. 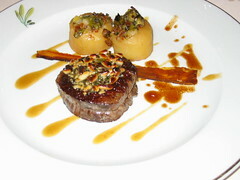 The second main course was a filet of beef with pine nuts and baked potatoes, stuffed with assorted diced vegetables. Again, I found the beef a bit dry and I didn't particularly care for the pine nuts that went atop the meat. 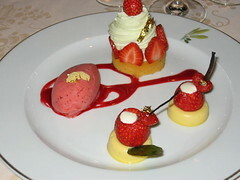 When dessert arrived, I was beginning to think the French were either really fond of strawberries or they had a really good harvest. Strawberries done three ways! Ice cream, filled with cream and served with white chocolate mousse, and strawberry shortcake with a mountain of whipped cream. The dessert was pretty good, even if I don't like strawberries, except dinner had been so heavy that I couldn't really finish the shortcake and cream. So far both dinners had been at restaurants rated with one Michelin star each, and with Michelin stars being such a big deal in the country, I was kind of expecting the food to be pitched at a much higher level. Not that it was bad, of course none of the food was bad, just that having been to very good, albeit unranked by Michelin, restaurants in Singapore, I was surprised that the star system wasn't all it was hyped up to be. But it was only two days into the trip, with many more meals to go. After a long flight and a bus ride, we check into our first hotel, Le Mas d'Artigny, in Saint Paul de Vence, a town near the sea in Cote D'Azur. We arrive in time for lunch, or at least, the late lunch, because all that's really left is a cold buffet. 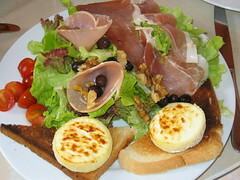 My first thoughts about food from this part of France - lots of vegetables and cheese. 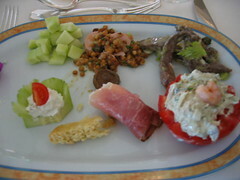 The cold plate was about 50% vegetables, from beans to cucumbers to tomatoes (fruits, whatever), with generous helpings of a very creamy cheese (could have been creme fraiche, I was too tired to care), and not all that much meat. Lunch wasn't mindblowing, but I was hungry and it was very filling. I could barely manage the cheese course and had no room for dessert. Sated, I settled back and waited for dinner. Dinner was at the hotel's restaurant. 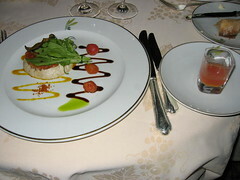 French food is known for being rich, so why not start the first dinner with an unhealthily rich meal? 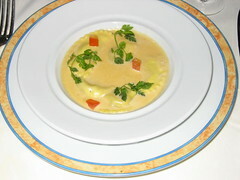 Ravioli of foie gras and black truffles, in a delightful cream sauce. This was really good - the foie gras melted away into my throat the moment the ravioli skin broke, and the cream sauce was a good complement. With so little meat at lunch, I had to have a nice thick slab of beef, and the pavé of filet of beef with caramelised pears and potato was the only logical choice. I actually thought the accompaniments were better than the main attraction; the beef was surprisingly chewy. The caramelised pear was perfect though, and the potatos were nicely browned and flavourful. Dessert was hard for this one. 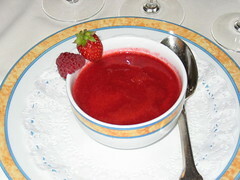 There was no chocolate dish, or at least none that wasn't contaminated with some other base concoction, so I settled for the red fruit compote (a dessert which, apparently, is very popular in the south of France, because I saw it on many many menus). Didn't really like this one, as the compote must have been made with fruits rather too acidic for my liking. Sourness that went straight through your tongue and into the wine. Incidentally, is it just me, or does sweetness kill wines more completely than sourness? Wines always taste terrible after (most) desserts. In any case, day two's gastronomic adventures awaited. Off to France for two weeks. Lots of Provencal food to come, hopefully. 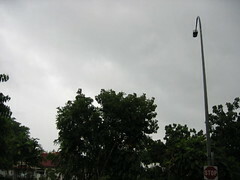 Will try and post pictures and stuff. See you guys in two weeks. Michelangelo's is the flagship restaurant of Angelo Sanelli, who was featured in the papers recently, as he's started a new cooking school called Bent Fork in Chip Bee Gardens just next to Shermay's Cooking School and down the road from his restaurants - Michelangelo's, Original Sin and Sistina. Being located in Chip Bee Gardens has its disadvantages, and parking is definitely one of them. Not only do you have to pay per 30 minutes, it is not always easy to get a parking lot, let alone one close to the restaurant. Otherwise, it's quite nice to see an entire row of restaurants competing for your patronage. Michelangelo's offers both indoor and al fresco dining, which, unless you are an expat or a smoker or just very willing to perspire, you would do well to avoid. 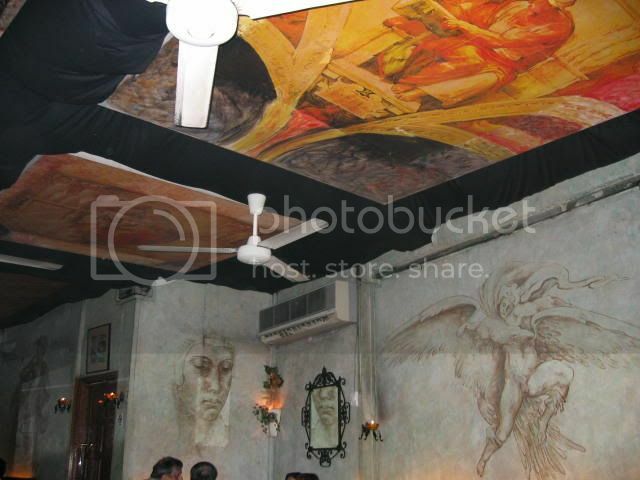 The interior of Michelangelo's is very interesting, as the walls and ceilings are covered in murals. While they are not exactly worthy of the Sistine Chapel, they are certainly a welcome relief from cheap wallpaper and lots of glass. However, I dislike restaurants that are not well lit, and Michelangelo's sole source of lighting are little tabletop candles, forcing you to squint at your menu to place your order. 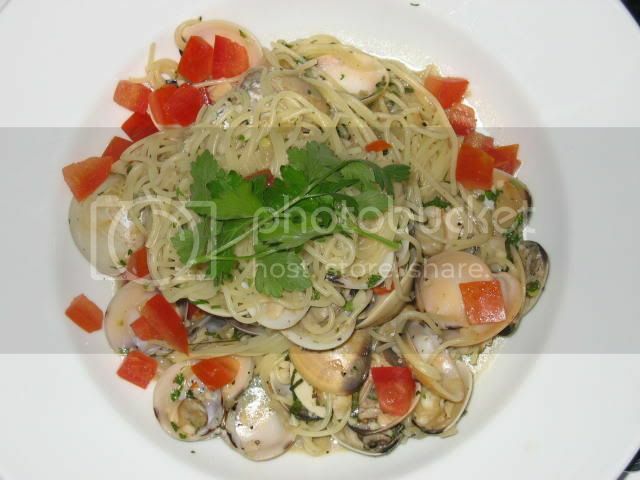 As I was not very hungry, I opted for the Vongole Ancora, basically angel hair pasta served with clams in a white wine sauce and topped with a tomato confit ($26). This wasn't too bad (3/5), as the restaurant was very generous with their clams and garlic, but as a general rule I despise angel hair pasta. One of the good things about Michelangelo's is that the staff are quite on the ball. 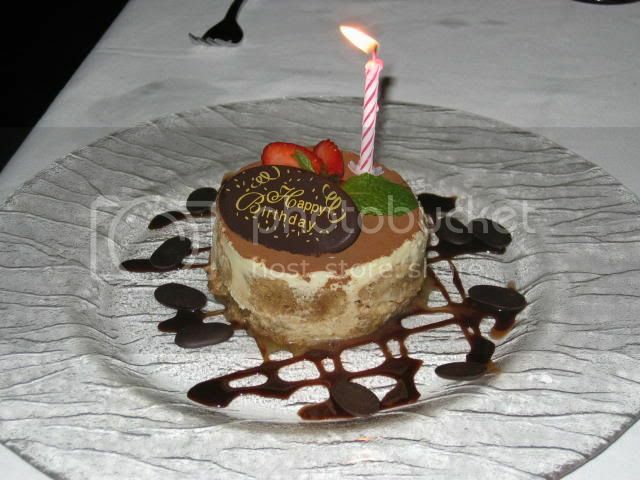 Although our assigned waiter didn't do much apart from filling our glasses, a female waitress noticed me unwrapping my gift, and very kindly offered to take pictures for us, and after our dinner, a complimentary birthday tiramisu arrived from the kitchen. As tiramisu goes, this one wasn't exactly mind-blowing (2.5/5). It could have done with substantially more coffee, and rather more alcohol as well. I don't know what liquid they were using to soak the base of the tiramisu, but the end result tasted more like sugar water than alchohol. On days like this, when the skies are dark and grey, when you've slept in most of the morning, and you've played mahjong till 3am in the dawn, it is a good day to have brunch in a little deli and watch life go by. The Cellar Door certainly qualifies. Nestled along the row of quaint food shops in Bukit Timah Road, it actually has two outlets only a few doors away from each other: a deli, and a cafe. Like Corduroy & Finch, the Cellar Door attracts many Caucasians and expats, and as you are eating oversized sandwiches and drinking hot chocolate, you could almost imagine yourself in a cafe in Sydney or London, enjoying a late brunch as you planned what to do with the rest of your day. I had previously mentioned my quest to find the perfect chocolate milkshake, and the one they serve here, while exorbitant ($6.50), is close to one of the better ones I've had so far (4/5). 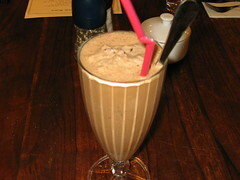 The chocolate ice-cream was thick and lush, delectably creamy and never shying away from asserting its chocolateness, which probably owed something to their use of solid chocolate in the shake. Unfortunately, the residual bits of chocolate, while adding to the taste of the drink, detract from its otherwise uniformly creamy texture. The Cellar Door (both deli and cafe) sell very good dips ($4). 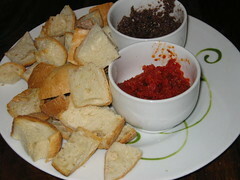 The ones you see here are the olive tapenade and tomato pesto. While I find the olive tapenade to be a little too strong for my tastes, I quite like the tomato dip as well as the classic pesto that they have. These are available for takeaway and make a good hors d'oeuvre. limp. My hopes for this sandwich were disappointed when it arrived. Though they gave me a large sandwich, plus salad on the side, it was not very good (2.5/5). 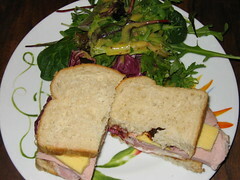 The ham was dry and tough, and the peach chutney was so meagre that it looked more like the ham had grown a mole. The Cellar Door is a very cosy environment to have brunch or tea with friends and relax over a nibble of bread and olive tapenade, and the decor, while somewhat eclectic (note the Warholesque pictures on the wall), is serviceable. Where the place fails though, is in service. While they were crowded, it did seem unreasonable that we waited for in excess of twenty minutes for sandwiches and eggs. In order to celebrate my birthday, the completion of my course and as a section lunch, my boss took us to eat at a Teochew restaurant he was fond of. 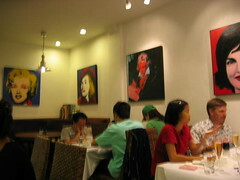 The Swa Garden restaurant is a moderate restaurant tucked away in Macpherson, and is fairly casual as Chinese restaurants go, ie no napkins but paper serviettes, and no one minds if you talk about your dog's incontinence at the table. 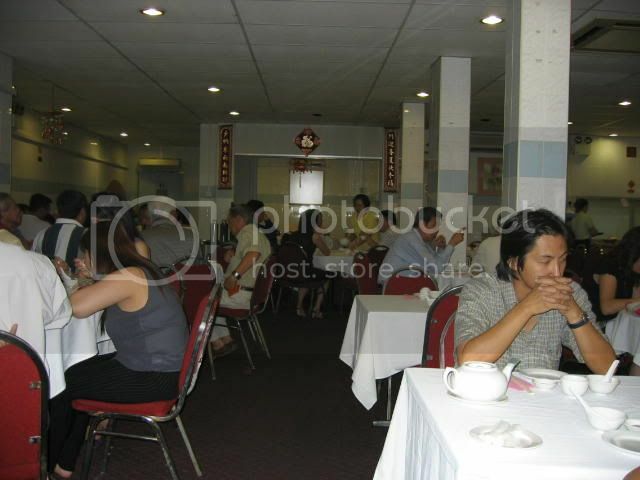 This may be part of the reason why the restaurant is so popular, as it was nearly full by lunchtime. Service isn't anything to scream about, and you will usually have to fill your own teacup, but at least the food doesn't take ages to arrive. 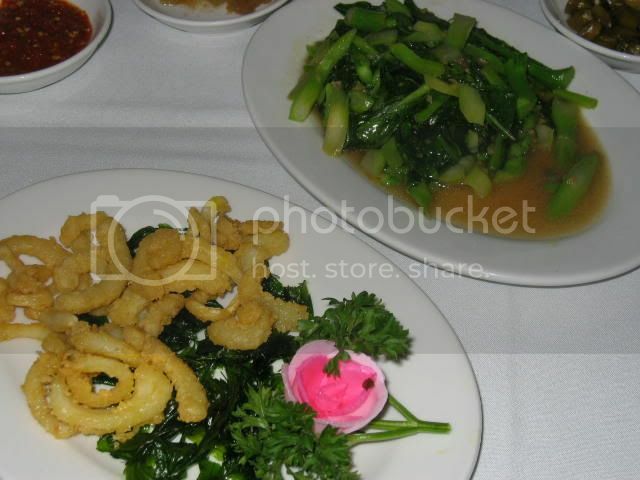 What came along first was a plate of stir-fried vegetables and deep-fried squid, which in typical Teochew fashion was not heavy on sauce or spices, but tasty nonetheless. The squid came along with a bed of fried-till-crisp basil leaves, which I thought was an interesting touch. 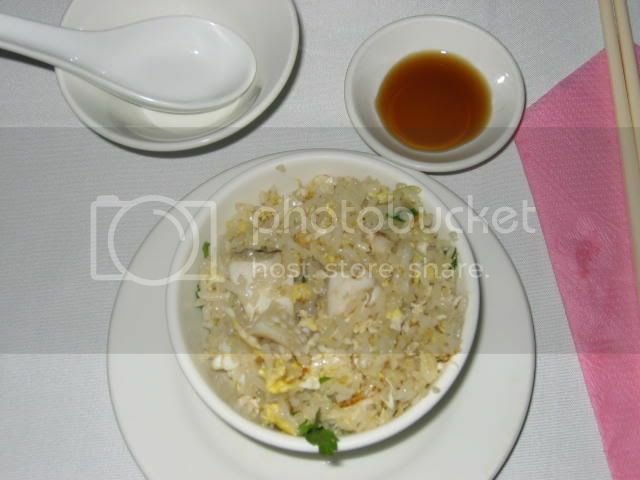 I never knew the Teochew had their version of fried rice, but apparently they do. Either that or the restaurant took liberties with an old favourite. The addition of slices of fish actually adds another layer of flavour to the rice, and the rice itself is quite moist, not dry and chewy like fried rice tends to be. 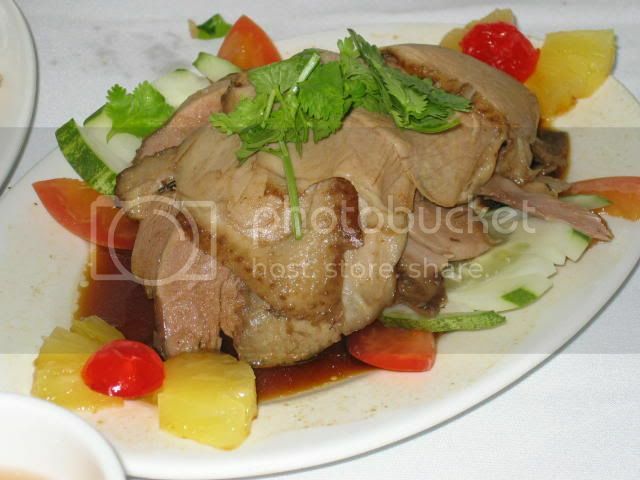 This is apparently one of their specialties: braised goose with beancurd underneath. 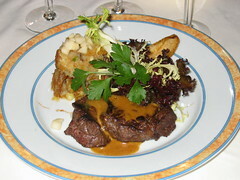 It was good, too, the goose was juicy and tender, even if it is bad for you and makes you fat. 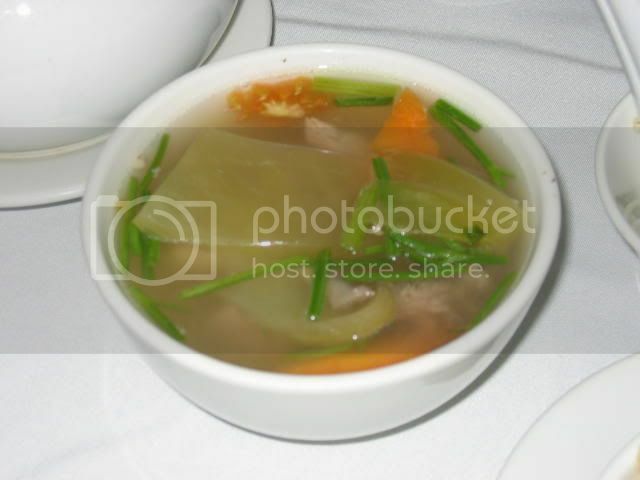 We also had a serving of duck soup, which was basically duck boiled with things like pickles and tomatoes. I'm not sure I really like this, mainly because I'm not really a fan of sour soups like tom yam, and when you boil pickles and tomatoes you get an inevitable sourness permeating the otherwise clear sweetness of your stock. 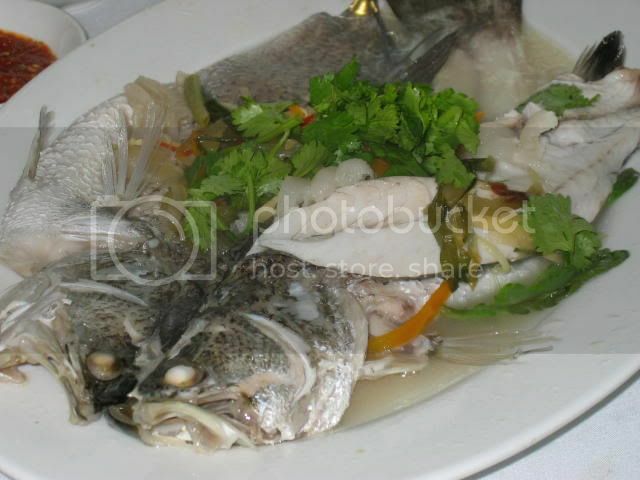 What would a Chinese meal be without steamed fish? I don't know what fish this was, but there was plenty of flesh to go around. Now, I'm not an expert fish eater, so I don't know if it was overcooked or not, but to my untrained palate, it seemed fine to me. 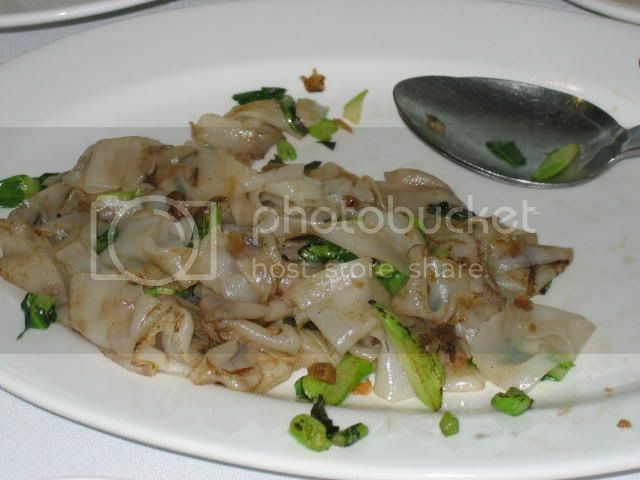 According to my boss, what Swa Garden is particularly famous for is its fried kway teow. Unlike the normal Singaporean char kway teow, the Teochew version uses much less sauce, resulting in a drier version, with simple flavours like vegetables and radish dominating the dish. It's probably a bit of an acquired taste, as both my colleague and I found it a bit dry for our liking. I thought it was even a little rubbery.